Singer-songwriter, multi-instrumentalist and producer Rachael Sage has premiered the exclusive stream of her latest album, "Myopia", via Curve Magazine. The collection is out May 4 via MPress Records/ILS/Caroline and is her 13th full-length release. 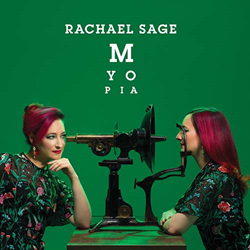 Singer-songwriter, multi-instrumentalist and producer Rachael Sage has premiered the exclusive stream of her latest album, "Myopia", via Curve Magazine. The collection is out May 4 via MPress Records/ILS/Caroline and is her 13th full-length release. Listen and share here and via iTunes and Amazon. Sonically, "Myopia" is a bold departure for Sage, with a much stronger emphasis on her guitar playing over her usual piano palette, with inventive contributions by Hoboken-based guitarist James Mastro (Patti Smith, Ian Hunter) who Sage affectionately calls “the king of wah.” Produced by Sage and her longtime engineer John Shyloski, "Myopia" was recorded last summer at Carriage House Studios in Stamford, CT as well as at Sage’s home studio in NYC’s East Village, and you can feel the swelter. The heavily electronic "Haunted By Objects" – on which Sage plays Moog synthesizer – describes the psyche of a hoarder whose only potential recourse may be to set everything on fire, while “This Darkness”, a bluesy lamentation about the Dakota Pipeline, reflects the urgency and courage of Native Americans’ resistance to environmental desecration; the enemy in the dark is indifference, the iciest kind of blindness. ABOUT RACHAEL SAGE: Since founding her own label MPress Records two decades ago, NYC-based alt-pop artist Rachael Sage has steadily released a slew of vibrant, dynamic albums with poetic lyrics spanning subjects as wide as her inspirations. She has toured with an eclectic list of artists including Ani DiFranco, Beth Hart, Sarah McLachlan, Judy Collins and Howard Jones. Sage also continues to significantly grow her visibility via her many song placements, having recently landed her 22nd song on top reality show Dance Moms, translating into over 10 million YouTube hits. Her new album Myopia is a bold departure for Sage, with a much stronger emphasis on her guitar playing over her signature piano palette. Produced by Sage and her longtime engineer John Shyloski, the album features drummer Doug Yowell (Joe Jackson, Duncan Sheik), keyboardist Rob Curto (Lila Downes), trumpeter Russ Johnson (Elvis Costello, Deborah Harry) and bassist Mike Visceglia (Suzanne Vega). Sage recently wrapped up an 8-week U.S. pre-release tour with UK chart-topper Howard Jones, whose ballad “No One Is To Blame” appears on Myopia and debuted in Billboard.